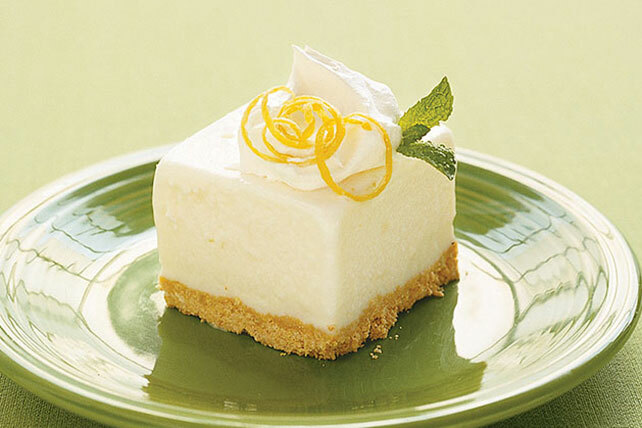 Try our Frozen Lemon Squares. Our Frozen Lemon Squares recipe tops a graham cracker with blended lemonade concentrate and frozen yogurt for a cool treat. Mix graham crumbs and margarine; press onto bottom of 9-inch square pan. Beat yogurt and concentrate with mixer until blended; spread over crust. Garnish with fresh mint sprigs and lemon slices or peel. Empty remaining lemonade concentrate into small pitcher. Stir in 1-1/2 cans water. Refrigerate until ready to serve over ice. Serve this refreshing dessert topped with fresh raspberries.